Tottenham boss Mauricio Pochettino says Harry Kane is "an animal" but insisted he will decide when his star striker returns from an ankle ligament injury. Kane has been sidelined since 13 January but is back in training and is keen to face Burnley on Saturday. "I don't care if he wants to play or not," Pochettino said. "If you ask him 10 days ago he was ready to play. "Every player that came from an injury or illness, it's about the structure, when he's possible to play or not." 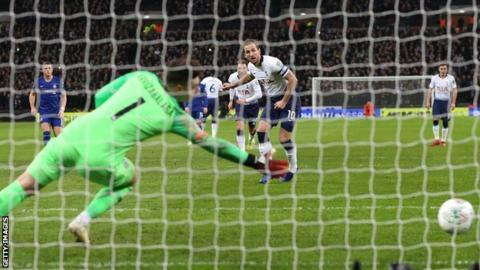 Soon after Kane's injury, Spurs were eliminated from both domestic cup competitions, but they have won all four Premier League matches without him and took a major step towards the Champions League quarter-finals with an impressive 3-0 win over Borussia Dortmund in last week's first leg at Wembley. Since returning from the Asian Cup at the end of January, utility forward Son Heung-min - who has been likened to a "battery" by Pochettino - has scored in four successive matches and the South Korean now has 16 goals for his club this season, only four fewer than Kane. Kane, Tottenham's top scorer for the last four seasons and winner of two Golden Boot awards, was initially not expected to return to training until early March following his injury sustained against Manchester United at Wembley. "He's not ahead of schedule but everyone knows that Harry is an animal, he wants to be ready as soon as possible," Pochettino said. "In some injuries, you cannot push too much, because you need to be careful. When it's a massive injury it's completely different. "We're so happy that in the last 10 days he was fantastic, back in training again, and he can be available again. It's going to be a massive impact for everyone." Spurs are still without England midfielder Dele Alli, who injured his hamstring in the victory at Fulham last month. "He's in a key part, maybe the last part of his recovery and that is a key part and we can't know if it will be one week, 10 days or two weeks, we're going to assess him day by day," the Spurs boss added. Spurs have finished third, second and third in the last three seasons and can move to within two points of leaders Manchester City and Liverpool with a win at Turf Moor on Saturday. City are in Carabao Cup final action this weekend, while Liverpool travel to Manchester United on Sunday.